A very Happy New Year to you all – welcome to 2017! It couldn’t have been a tougher start to the year for Hammer in the Middlesex League. 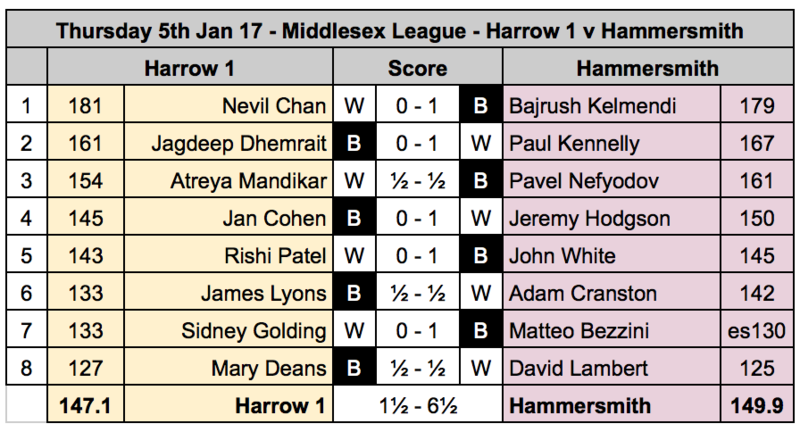 We were up against league favourites Harrow 1 away from home. Losing our board one and in-form Carsten through illness in the morning was not a good start. However, the rest of the team proved they were up to the challenge in spectacular fashion. We were impressed to see digital clocks on all of the tables – less impressed that our hosts didn’t know how to set them (! ), leaving us puzzled and frantically hitting the buttons until we found a suitable setting. It soon transpired that our hard Christmas opening preparation was to pay off. Everyone on the team plays a fine game, and at no point did anyone look to be losing. We ended the night with five wins and three draws – a fantastic result given we were matched for grades across the boards. Special mentions to Bajrush, Pavel and Matteo, who all made their debuts for the team this season, bring the player count up to an impressive 22 different faces over five matches. Next week we play their second team at the same time, and at the same venue, where a performance half as good would all but seal another big victory! Glad to see I wasn’t missed. Hammer performance grade for the match = 181! Can’t believe we’ve had 22 different players involved already too. Impressive stuff. Next Next post: Hammered in the Thames Valley!